One or more awards of $250-$500 are given annually to individuals whose research in the Southern Labor Archives will lead to a book, article, dissertation, or other substantive product. In return, recipients agree to make a presentation about their research to the Georgia State University community within one academic year after receiving the award. 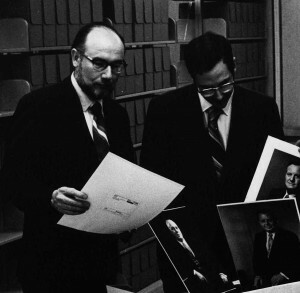 Professors Merl E. R eed and Gary Fink were instrumental in the establishment, development, and use of the Southern Labor Archives at Georgia State University from the early 1970s. Today, the Southern Labor Archives has over 500 collections used by researchers from throughout the Southeast, the United States, and the world. Created in 2000, the Merl E. Reed Fellowship in Southern Labor History was named, at the urging of Dr. Fink, to honor Dr. Reed’s career and role in the founding of the Southern Labor Archives. After Dr. Fink passed away in 2008, Dr. Reed requested that the name of the Fellowship be changed to honor Dr. Fink as well. The Reed Fink Award in Southern Labor History now honors both men and their many contributions to education, labor studies, and the Southern Labor Archives. Faculty members, graduate students, upper-level undergraduates, and recognized independent scholars and artists are encouraged to apply. To be considered for the 2011 Reed Fink Award in Southern Labor History, applicants should submit materials postmarked by November 30, 2010. If you choose to submit your application and supporting material electronically as .pdf documents, please e-mail them to archives@gsu.edu by end of day November 30, 2010 (please indicate in the subject line that the e-mail is a Reed Fink Award Application). Download the 2011 application here. For more information about the Reed Fink Award in Southern Labor History, please contact Traci Drummond at 404.413.2880 or at tdrummond@gsu.edu. This entry was posted in Anthropology, Business, Economics, For Faculty, For Graduate Students, For Students, General News, History, Nursing, Political Science, Sociology, Special Collections & Archives, Uncategorized, Women's, Gender, and Sexuality Studies and tagged research assistance, Southern Labor Archives. Bookmark the permalink.